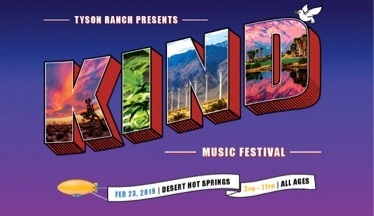 The inaugural KIND MUSIC FESTIVAL (KMF) debuts Saturday, February 23 in Desert Hot Springs, CA on the future site of Tyson Ranch Resort, a 420-acre entertainment complex, luxury glamping resort and cannabis research & design facility created and owned by Mike Tyson. The line-up for the one-day pop-up event starting at 2:00 PM will include performances from MIGUEL, CHICANO BATMAN, STARCRAWLER, YONEE and ALL MY FRIENDS HATE ME. KIND MUSIC FESTIVAL will have the distinction of being the first-ever music festival that embraces California’s updated 2019 cannabis regulations. While being an all ages event, alcohol may only be consumed by those who are 21+ and present a valid ID. In addition, there will be no sales of cannabis products at the festival. Partners include some of the most prominent executives from sports, entertainment and traditional business. KIND MUSIC FESTIVAL will provide a platform where “The Kind Generation” can connect with like-minded peers while cultivating awareness for the health and wellness benefits of cannabis with ground-breaking technology and cutting-edge music. ﻿Be sure to stay connected with us at TandA Media for more news and coverage to come on Kind Music Festival.